NEW! An exclusive interactive ebook, including AUDIO recording throughout the text (2 speeds, no download, no online streaming)! 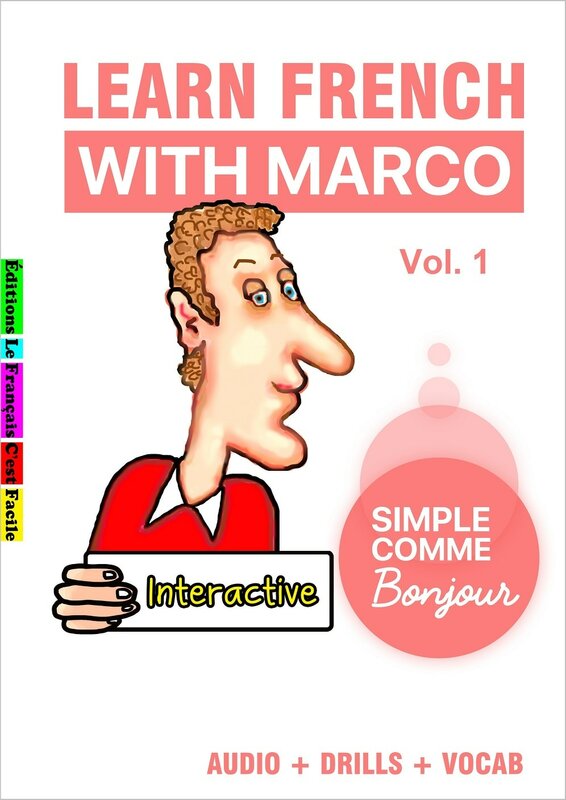 Learn French the easy way with Marco's stories, and pick up good habits from day one! Lots of people who only learn French from books quickly pick up bad habits, especially when it comes to pronunciation, how to use articles, and prepositions. These habits fast become ingrained, and very hard to get rid of. This book will help you develop good habits from day one (or get rid of the bad ones you already have), by covering the most common errors that people make. It's useful to already know a few French basics when using this book, but it's also possible to start using it if you don't have any prior knowledge of French. This book allows you to easily review and consolidate what you already know. This is done through reading a simple story, listening to recordings throughout the text, and through English translations of the French text, so that you understand all the vocabulary. There are also gap-fill exercises so that you can test what you've learned. 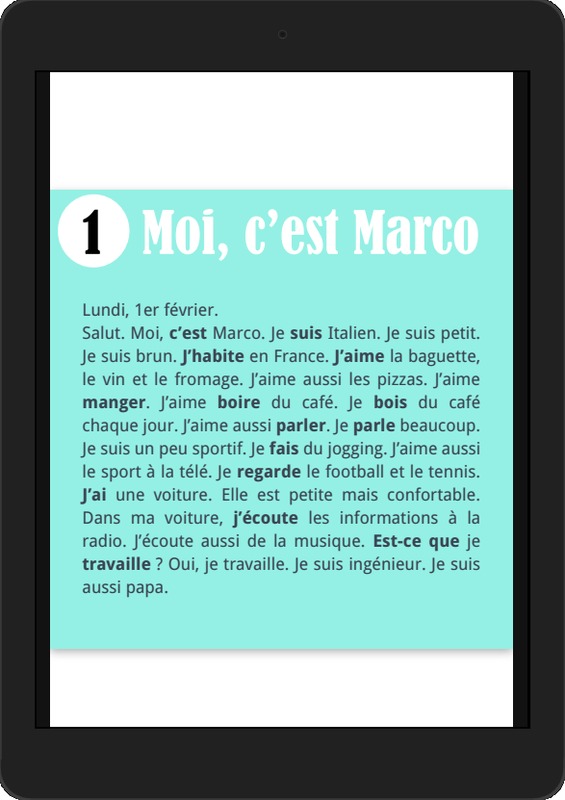 Each chapter tells a short story about Marco, an Italian who's learning French. 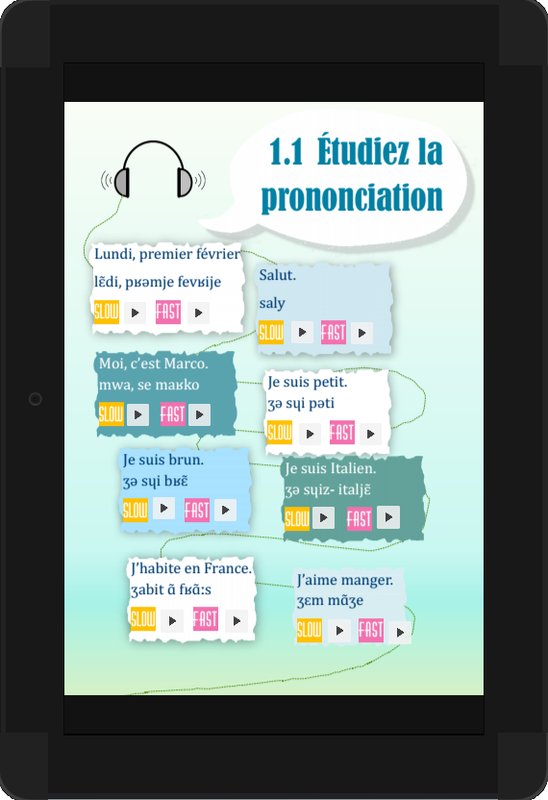 The difficulty level increases over the course of the chapters, and the vocabulary used has been chosen from the 1000 most-used French words. 1.Pronunciation, as it's important to pronounce new words correctly from the start. 2.Vocabulary, with the English translation of the text opposite the French version. This avoids any uncertainty about the meaning of a phrase. 3.Grammar, with short exercises and corresponding answers, so that you can see for yourself where you're making mistakes (if you're making any at all!). By using this book, you avoid developing bad grammar and pronunciation habits before moving on to the next chapter. This book is not just another textbook. It's a step-by-step guide, a sort of virtual teacher guiding you through each chapter, allowing you to put together different aspects of French naturally and effortlessly. 1.A slower pace, to let you really hear the pronunciation of each word. 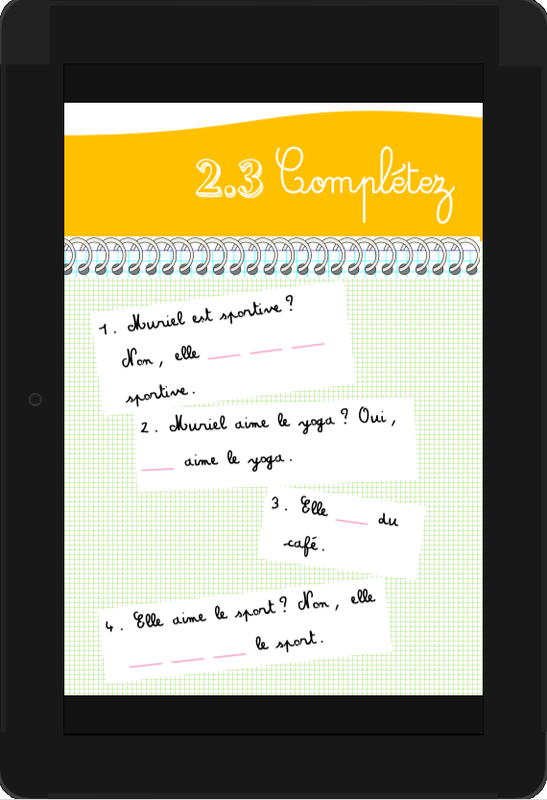 2.A faster pace, so that you can get used to hearing how native French speakers really speak. These short stories are perfect for beginners. You'll be able to enjoy reading in French, grow your vocabulary in a natural way, and improve your comprehension at the same time. 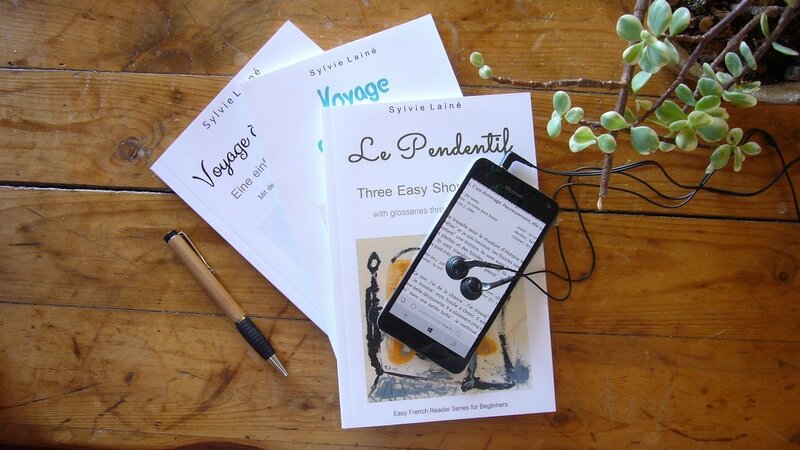 - Enjoyable and carefully written stories : you can accelerate your understanding whilst learning a wide range of new vocabulary and rapidly improving your French comprehension. - Useful French-English glossaries under each paragraph. You'll be able to focus on enjoying reading, because no dictionary will be necessary. - Simplified sentence structures and a very basic vocabulary, using straightforward grammar, so that even novice learners can appreciate and understand the intricacies of coherent French speech. - A realistic amount of new vocabulary, with a special emphasis on short sentences, natural dialogs and high frequency words and expressions so that you can enjoy reading and learn new grammatical structures with ease. - A large french-english dictionnary at the end of the book: you can easily find any word from the story again, with its gender and its exact english translation. Two English people decide to look for an old friend in France. Will they find him after forty years of absence? This story is perfect for beginners: you'll be able to enjoy reading in French, grow your vocabulary in a natural way, and improve your comprehension at the same time. - Simplified sentence structures anda very basic vocabulary, using straightforward grammar, so that even novice learners can appreciate and understand the intricacies of coherent French speech. This story is perfect for beginners. You'll be able to enjoy reading in French, grow your vocabulary in a natural way,and improve your comprehension at the same time. - An enjoyable and carefully written story : you can accelerate your understanding whilst learning a wide range of new vocabulary and rapidly improving your French comprehension. - A realistic amount of new vocabulary, with a special emphasis on short sentences, natural dialogs and high frequency words and expressions, so that you can enjoy reading and learn new grammatical structures with ease. - A large french-english dictionnary at the end of the book : you can easily find any word from the story again, with its gender and its exact english translation. Get Your Free French Audiobook Now!